Which Small Hatch Should I Buy: Hyundai i30, Mazda3, Honda Civic or Toyota Corolla? — Auto Expert by John Cadogan - save thousands on your next new car! Frankly a lot of this choice is down to personal preference - it's not as if there's a real dog among your four choices. Personal preference (specific features and relevance to you, plus comfort and versatility in the context of your lifestyle) are very important - at least as important as kilowatts, etc. Take a good look at the following vehicles at the dealership, and make sure you drive each. Try and get hands on with models as close to your desired price-point as possible. When you know which one you want, let me know via the contact form here and I will get the broker to search for one at the lowest possible price. More on how this works. If you're in the market for finance it's vital to get both the finance and also the form of vehicle ownership exactly right. Read my guide to car finance, and also my guide to beating car dealers. The new Mazda3 is an excellent car. One of the most popular in the country, for good reason. if you want strong performance, steer clear of the 2.0-litre base models and go for the 2.5-litre. It's much stronger on the performance front and comes with a substantial equipment upgrade as well. Some people have criticised the road noise, but I don't agree: having spent two weeks in both the base model and the SP25 GT, it's quite civilised. 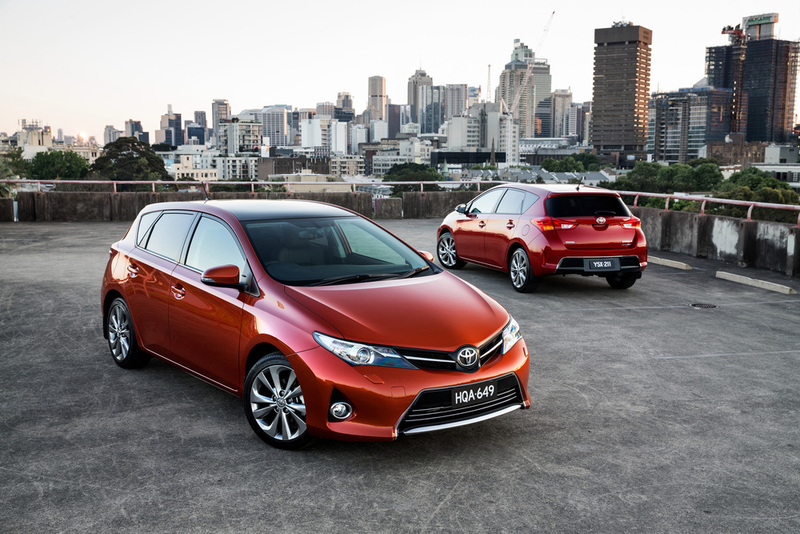 The Toyota Corolla is a great car - best Corolla ever. It's hard to imagine you're going wrong buying one. Buy I'd certainly check its fundamental value proposition against the i30 (and Kia Cerato, which isn't on your list but should be). I'd also check what it offers against your personal preferences. Unfortunately, anecdotal evidence of a problem with Hyundai's glass 'panorama' roofs seems to be emerging - haven't heard anything negative on the i30 yet, but since this kind of roof is available in the fully loaded model I'd be factoring it into my decision. Read more on the Hyundai sunroof spontaneous shattering problem here and decide for yourself. At this stage it seems to be a low probability/high consequence event, and i30 hasn't been involved to the best of my knowledge. New Civic's got the look - but has Honda really got its mojo back? Honda Civic: you'd really have to convince me on this. Honda's sales have tanked over the past five years, as a result of them dropping the ball on their product range following the GFC and tsunami. They really have not recovered adequately and today I think the product is well behind Mazda's. Honda might be showing signs of recovery with this new Civic, but I'm not sure. And, seeing as I am sure about the others, that would be enough for me to scratch it. There's no way you could convince me the Civic is a front runner here in this group of four. It's not a dog, like the Holden Cruze (woof woof ... see why here) but it's not a photo finish with the others in your list. The way to save money when you buy the car you select, ultimately, is laid out here in my guide to buying a new car here. This is a good place to start learning the ropes, because there are a great many rip-offs embedded in the process if you aren't both aware and careful. This section, which includes a video on the way to represent yourself to maximum effect, allows you to cut through the crap in the process and advocate effectively in your own self-interest. Let me know when you get close, and I hope this information helps. How do you tell - really tell - if those tyres are correctly inflated? Getting this right can save you hundreds in preventing premature wear. Volvo: the anti-kudos Euro car. The safe option. But is there a dark side to Volvo ownership that few will acknowledge? Let's find out. Two cool sporty cars - but is there an objective case for choosing the Veloster Turbo over the MX-5, or vice-versa? Let's find out. Have you ever test-driven a car and hated the big, wide pillars in front, which hold the roof up? Have you ever wondered why they're not thinner? Should I Buy the Outback, Santa Fe or CX-5?